user warning: Table './active5_foxes/cache_filter' is marked as crashed and should be repaired query: SELECT data, created, headers, expire, serialized FROM cache_filter WHERE cid = '2:db8611c708375719fdf3e8fd735168db' in /home/active5/public_html/drupal6_multisite/includes/cache.inc on line 25.
user warning: Table './active5_foxes/cache_filter' is marked as crashed and should be repaired query: UPDATE cache_filter SET data = '<p><img alt=\"\" src=\"http://www.catchingfoxes.com/sites/www.catchingfoxes.com/files/resize/blog/Screen%20Shot%202014-10-14%20at%201.42.52%20PM-486x635.png\" style=\"width: 486px; height: 635px; border-width: 5px; border-style: solid; margin: 10px;\" title=\"\" width=\"486\" height=\"635\" /></p>\n<p>I think a lot about how to help Nathaniel understand and engage with the world and how to help the world understand Nathaniel. In this light, Halloween has been troubling me.</p>\n<p>How does a child who can not speak and does not eat participate in Halloween?</p>\n<p>We could skip it. There are many Christian homeschool families that avoid the holiday all together. We did at one point in our child rearing. In recent years Halloween has provided an excuse to spend time with our friends, Dan and Kelly and their seven children. 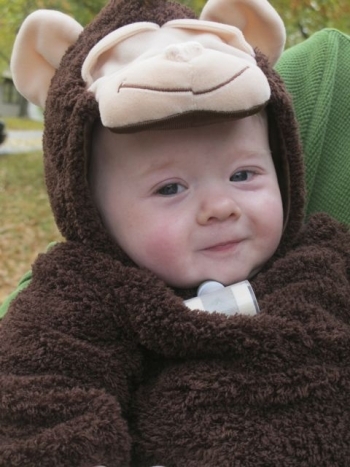 Last year, Nathaniel&#39;s first Halloween, was a cold and rainy week night. After enjoying soup with our friends, we brought him home and missed the door to door part of the evening. We could probably do that every year.</p>\n<p class=\"rtecenter\"><img alt=\"\" src=\"http://www.catchingfoxes.com/sites/www.catchingfoxes.com/files/resize/blog/IMG_0984-350x467.jpg\" style=\"width: 350px; height: 467px; border-width: 5px; border-style: solid; margin: 10px;\" title=\"\" width=\"350\" height=\"467\" /></p>\n<p class=\"rtecenter\">Nathaniel Halloween 2013</p>\n<p>But I do not want to get in the habit of avoiding things that are difficult. God&#39;s grace is sufficient to push through hard situations toward new solutions. He meets my parenting struggles with gifts of creativity and possibility.</p>\n<p>In speech therapy today, Nathaniel was given a file folder with laminated picture squares representing nursery songs. He selected a square, handed it to his therapist, and she sang. Mary Had a Little Lamb. Old McDonald. Mr. Sun. He gave her the Mr. Sun square over and over. It was his favorite. While Nathaniel uses his iPad speaking app occasionally in specific settings, we are still working with him in learning to instigate communication and express himself. 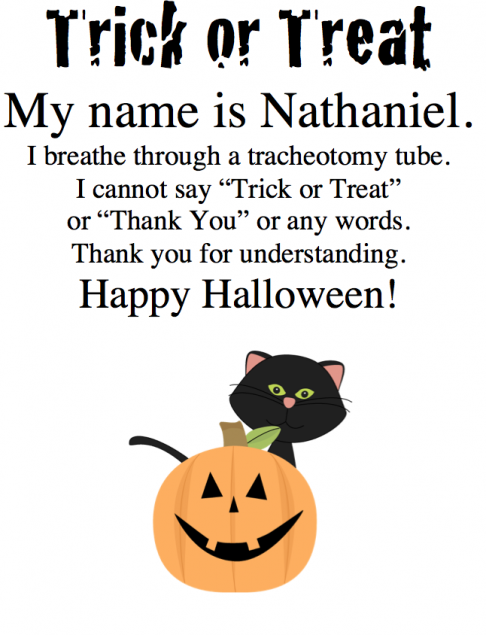 The purpose of the file folder song game was two-fold: Nathaniel had to &quot;ask&quot; for something, and it provided another setting to learn that pictures represent things.</p>\n<p>Halloween, slightly modified, offers the same communication opportunity. When he goes door to door with his friends, Nathaniel can offer the card above in exchange for candy. A world that understands Nathaniel will be a world that is more accepting of all the Nathaniels.</p>\n<p>But what about the fact that he cannot eat?</p>\n<p>At our meeting last week, Nathaniel&#39;s doctor&#39;s approved the use of suckers. One of his therapists suggested it for continued growth in oral strength. Some how, details are hereby delegated to Dad and teen brothers, all candy collected by Nathaniel will change into Dum Dums and Tootsie Pops.</p>\n<p>Do you have a kiddo that needs to modify Halloween celebrations? <a href=\"http://www.catchingfoxes.com/sites/www.catchingfoxes.com/files/Trick or Treat 2014.doc\">Feel free to edit this word document to meet your needs.</a></p>\n', created = 1555820148, expire = 1555906548, headers = '', serialized = 0 WHERE cid = '2:db8611c708375719fdf3e8fd735168db' in /home/active5/public_html/drupal6_multisite/includes/cache.inc on line 108.
user warning: Table './active5_foxes/cache_filter' is marked as crashed and should be repaired query: UPDATE cache_filter SET data = '<p class=\"rtecenter\" style=\"\"><a href=\"http://www.facebook.com/CatchingFoxes\" target=\"_blank\"><img alt=\"\" src=\"/sites/www.catchingfoxes.com/files/resize/social/facebook-64x64.png\" style=\"text-align: center; width: 64px; height: 64px; \" width=\"64\" height=\"64\" /></a><a href=\"http://pinterest.com/kimmrankin/\" target=\"_blank\"><img alt=\"\" src=\"/sites/www.catchingfoxes.com/files/resize/social/big-p-button-64x64.png\" style=\"width: 64px; height: 64px; \" width=\"64\" height=\"64\" /></a><a href=\"mailto:kim@catchingfoxes.com\" target=\"_blank\"><img alt=\"\" src=\"/sites/www.catchingfoxes.com/files/resize/social/mail-64x64.png\" style=\"width: 64px; height: 64px; \" width=\"64\" height=\"64\" /></a><a href=\"http://www.catchingfoxes.com/rss.xml\" target=\"_blank\"><img alt=\"\" src=\"/sites/www.catchingfoxes.com/files/resize/social/rss-64x64.png\" style=\"width: 64px; height: 64px; \" width=\"64\" height=\"64\" /></a></p>\n', created = 1555820148, expire = 1555906548, headers = '', serialized = 0 WHERE cid = '2:48be9f28bc948ea32b70445d0a590c98' in /home/active5/public_html/drupal6_multisite/includes/cache.inc on line 108.
user warning: Table './active5_foxes/cache_filter' is marked as crashed and should be repaired query: UPDATE cache_filter SET data = '<div class=\"fb-like\" data-font=\"verdana\" data-href=\"http://www.facebook.com/CatchingFoxes\" data-send=\"false\" data-show-faces=\"true\" data-width=\"280\">\n	&nbsp;</div>\n', created = 1555820148, expire = 1555906548, headers = '', serialized = 0 WHERE cid = '2:854065b9b61ff8596c8fa62e384317c7' in /home/active5/public_html/drupal6_multisite/includes/cache.inc on line 108.
user warning: Table './active5_foxes/cache_filter' is marked as crashed and should be repaired query: UPDATE cache_filter SET data = '<p><strong>Catch for us the foxes, the little foxes that ruin the vineyards, our vineyards that are in bloom. </strong><br /><em>Song of Solomon 2:15 NIV</em></p>\n<p>Metaphorically, the &quot;foxes&quot; are the damaging attitudes and actions that can creep in and threaten the love relationship of a couple and a home. &nbsp;Catching Foxes is committed to being a resource as you guard against the things that might injure and destroy the harvest you are striving to grow in your home.</p>\n', created = 1555820148, expire = 1555906548, headers = '', serialized = 0 WHERE cid = '2:132a8457abcc78748ef29251eaa8f1d7' in /home/active5/public_html/drupal6_multisite/includes/cache.inc on line 108.
user warning: Table './active5_foxes/cache_filter' is marked as crashed and should be repaired query: UPDATE cache_filter SET data = '<p><a href=\"mailto:kim@catchingfoxes.com\">kim@catchingfoxes.com</a></p>\n', created = 1555820148, expire = 1555906548, headers = '', serialized = 0 WHERE cid = '2:fe7b2055d10a2c25c439ca4710d86502' in /home/active5/public_html/drupal6_multisite/includes/cache.inc on line 108. I think a lot about how to help Nathaniel understand and engage with the world and how to help the world understand Nathaniel. In this light, Halloween has been troubling me. How does a child who can not speak and does not eat participate in Halloween? We could skip it. There are many Christian homeschool families that avoid the holiday all together. We did at one point in our child rearing. In recent years Halloween has provided an excuse to spend time with our friends, Dan and Kelly and their seven children. Last year, Nathaniel's first Halloween, was a cold and rainy week night. After enjoying soup with our friends, we brought him home and missed the door to door part of the evening. We could probably do that every year. But I do not want to get in the habit of avoiding things that are difficult. God's grace is sufficient to push through hard situations toward new solutions. He meets my parenting struggles with gifts of creativity and possibility. In speech therapy today, Nathaniel was given a file folder with laminated picture squares representing nursery songs. He selected a square, handed it to his therapist, and she sang. Mary Had a Little Lamb. Old McDonald. Mr. Sun. He gave her the Mr. Sun square over and over. It was his favorite. While Nathaniel uses his iPad speaking app occasionally in specific settings, we are still working with him in learning to instigate communication and express himself. The purpose of the file folder song game was two-fold: Nathaniel had to "ask" for something, and it provided another setting to learn that pictures represent things. Halloween, slightly modified, offers the same communication opportunity. When he goes door to door with his friends, Nathaniel can offer the card above in exchange for candy. A world that understands Nathaniel will be a world that is more accepting of all the Nathaniels. But what about the fact that he cannot eat? At our meeting last week, Nathaniel's doctor's approved the use of suckers. One of his therapists suggested it for continued growth in oral strength. Some how, details are hereby delegated to Dad and teen brothers, all candy collected by Nathaniel will change into Dum Dums and Tootsie Pops. Do you have a kiddo that needs to modify Halloween celebrations? Feel free to edit this word document to meet your needs.